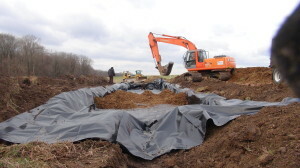 This practice aims to reduce the amount of sediment runoff from dirt and gravel roads using driving surface aggregates. DSA is designed to achieve maximum density to resist erosion and traffic wear. Properly installed DSA roads will have greatly reduced sediment loss and maintenance cycles. Maintenance of the road surface is periodic re-shaping to ensure proper drainage and traffic passage by incorporating loose material back into the road surface and re-establishing a proper crown. Proper grading techniques can improve road performance, lengthen maintenance cycles, reduce maintenance costs and reduce pollution impacts.